2016 Ram Truck owners are complaining that in cold weather, their truck windows are falling off the tracks and down into their doors. Baby, it’s cold outside! 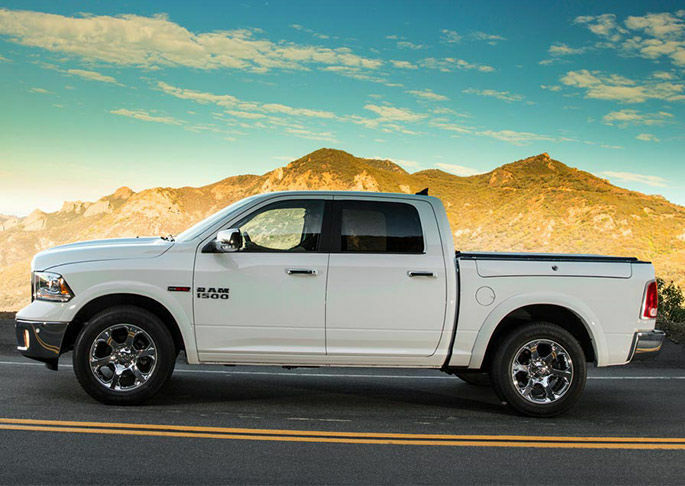 And that is apparently the problem for several owners of 2016 Ram trucks. They are complaining on a Ram Truck forum about their windows falling off the tracks and down into their doors. It is mainly happening to the driver’s side window and only in cold weather, the worst possible time to have your window disappear. Drivers are alarmed at how often it is occurring. “This is very common on the '16 models, our dealer said he has had them in all winter. It's happened twice to mine and the last time we didn't even roll the window down and weren't in the truck. Thunderhorse, who posts frequently on the forums, suggested that they take their concerns straight to Ram. “If everyone were to contact Ramcares that may get you some traction in getting a TSB. Several of the 2016 Ram owners have resorted to taping their windows closed until they can get to the dealerships, convinced that they will fall down again. That has to be very annoying and is not acceptable on a new vehicle. Another Ontario driver is very frustrated. “have had my truck for 3 weeks now and happened for the second time today and that was even after running/driving for 25 minutes. yes I'm in ontario, canada but none of my other trucks ever had this problem.” That certainly dispels the idea that warming the truck up would avert the problem. It will be interesting to see if Ram issues a technical service bulletin to fix all of the windows that are falling off their tracks. As long as they know what the problem is, it should be an easy fix. The other big question is “Have they fixed it on the 2017s”? I have a 2017, window has derailed 3 times in 1 month of ownership. I have Ram corporate involved now. this happened to me 5 times, on the 5th time the glass dropped completely into the door. Took it to the dealership and they replaced the window because it got scratched from the drop,and the entire mechanism (whatever you wanna call it) that allows the window to go up and down. Hasnt happened again since. But this only seems to be a problem during winters. Always had a Chevy thought this time would try a Dodge Our is doing the exact same thing. Last year and again this year already and it not even winter yet. This will be the second time having to get it fixed. Not Impressed ! My 2016 ram also has had this happen 2 times in the past week,new truck for me,bought it in august 2017 so this is going to be my first winter with it,anyway ...ive opened the door twice and put it back on ,only a 5 minute job but the plastic clip holding the window is not very strong at all ! I googled this because this is now the 3rd orc4th time my driver's window has done this. First time was in Dec, 4months after purchase. Put back on tracks happened again 3 wks later, did same fix...told me " avoid using when cold and stuck" WTH! bye bye dealer. Chose another dealer happened when it happened 3rd time in the 1st winter I had it. They put a new regulator in it. Guess what it's now 2nd winter and fell again. BTW, The first time it happened I had entered the parking ramp at work...managed to get it back up, but came out from work 8 hrs later and window was down...in a parking ramp...at work!! Totally planning to approach higher ups after this!! 2017 Ram Rebel. Can confirm they did not fix this on the 2017s as it happened to me today. I was lucky my flight was canceled or my truck would have been sitting in a parking lot with the window down for a week. I only found out because when I went to get in this morning the window had slid down by itself. I took it to the dealer and they replaced glass, and the mechanism. Said they had multiple complaints about this. But didn't give me a hassle. Now it's summer....wonder what's going to happen this winter! This happened to me last year a few months after I bought a new 2016 Ram 1500. Dealer replaced the two plastic clips that hold the glass to the regulator arms. Someone suggested that I carry a roll of duct tape and a piece of cardboard in case this happens again away from home. I hope Ram is listening, and someone doesn't have to sue them to get a permanent solution to this problem. Can you imagine coming back to your vehicle after shopping, only to find your truck full of rain/snow--or worse, some criminal waiting inside! Wake up RAM (BIG LIABILITY case waiting to happen)! I have a 2016 Ram and have had no issues but my daughters 2016 Ram does have this window issue. has anyone had any luck finding a solution to this problem? I was also told by the dealership not to use the window anytime it’s minus five or colder. He also said this is true of al vehicles. I find it hard to believe as I haven’t had this issue with other vehicles. 2016 with 18,000mi and this is the second time taking in to dealer to have it put back on. I have a 2017 Ram 2500. This just started and I am taking it for the 3rd time to the dealer next week. I have had it happen about a dozen times with the driver side 3 sides on the passenger and once on the back passenger side. Very frustrating I hope to see a recall soon. I have a 2017 2500 and just made an appt with the local dealer (Sarnia, ON) to have my driver side window fixed. I thought I'd look to see if I was the only one with an issue and obviously not. I have a 2016 Ram and my truck is currently at the dealer for the 5th time fixing this issue. They told me not to put my window down in cold weather. I have had my rear passenger side window do this once and my driver side 4 times. just happened in my 2017 ram rebel. This happened to my 2017 Ram Sport 11,000 miles on 1/16/18. I'm waiting for the part to come. You would think a dealer would have it on hand. I have a 2017 1500 and I need to have this repaired for 4 time (2 windows each time)...all in last 2 months. After it fails the first time a heavy frost will cause the issue (not exaggerating). I'm going to push for all new mechanism, putting it back on track is a bandaid at best. Last time it happened I was parked in a heated garage, window went down/up fine. I drove 3 miles to get coffee in drivethru and it was already frozen enough to break. You'd think a big, bad $60K truck could handle winter a bit better. The hassle, even under warranty, will push me to a different brand next time. I am following up on my earlier comment. I spoke to the dealer after bringing the truck in a second time. They realized the plastic clips in the window were not going to last or work if there was any issue (freezing or jam) the window would malfunction again. The dealer then told me they would order me a new window under the warranty. After I left the dealership and in the last two weeks. Apparently there were another 4-5 people who had the same issue. So they are waiting for windows or replacement metal or plastic clips. Also that Ram now knows that it's happening a lot to late 2015's, 2016's, and 2017's. Hopefully they can get this issue fixed. As it's winter time here in Massachusetts and it get's cold when your window is stuck down. This just happened to my 2016 RAM passenger side window. Heard a rattle, rolled the window down and after I powered it up, it fell repeatedly about halfway down. Happened to me today with my 2015 2500 RAM driver side window and 20 degrees outside. Not happy to hear that after fixed it will probably happen again and I am out of warranty by a few thousand miles. Happened to me as well today on my 2016 Ram, Drivers side window falls as the window is put down. Sticks at the top and I hear the track moving then the window suddenly drops. I came out of the grocery store tonight and my window was half down..